My love of travel and curiosity for the world around me has always been inside me. While most of my early life (pre-25 years old) was spent traveling and working throughout the US, the last 6 years have been filled with more domestic and a ton of international travel. I have been to all 50 states, 35+ countries, and all 7 continents. My journey to Antarctica in November of 2012 helped me fall back in love with running. From that trip I set a personal goal to run 1K miles and walk 1K miles over the course of 2013. As a competitive person, that challenge soon gave way to a goal to run/walk the distance around the equator (24,901 miles) by the end of 2022 (aka by the time I turn 40). This personal challenge along with my love of travel and sharing experiences with others led me to creating this blog and hopefully one day a company. 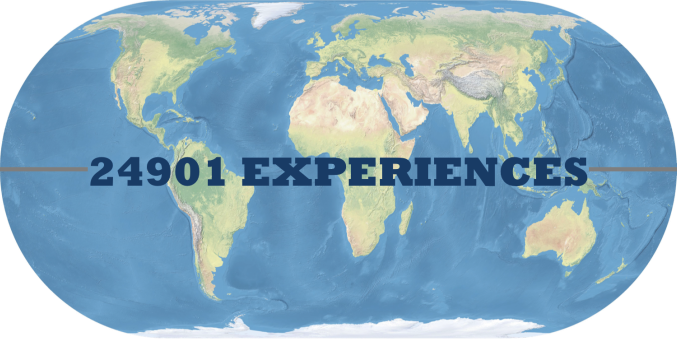 24901EXPERIENCES is your current source to follow along on my travels around the world. In the future, I hope to expand 24901EXPERIENCES to become a place where others can share their adventures with fellow travelers and allow them to research, plan, and seamlessly book experiences. BUT for now you are stuck with me.